Nigeria's most prominent rebel group says it carried out an "unprecedented attack" on an oil tanker facility close to the main commercial city of Lagos. "The depot and loading tankers moored at the facility are currently on fire," said the Movement for the Emancipation of the Niger Delta (Mend). Residents of the capital heard a loud blast, said the AFP news agency, but there was no official confirmation. Previous attacks by Mend have mostly hit the Niger Delta in the south. Such attacks have severely cut Nigeria's oil output. Production has been cut by a fifth in the last three years partly as a result of violence. In a statement, Mend said that "heavily armed" men had "carried out an unprecedented attack on the Atlas Cove Jetty in Lagos" at 2230 hours (2130GMT) on Sunday. The jetty is the main entry point for ships entering Nigerian waters from the west and for oil tanker loading. 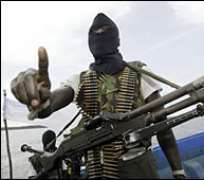 The alleged attack follows claims by Mend in recent days that it had blown up several oil pipelines and captured six foreign crew from onboard an oil tanker. Henry Okah, Mend's leader, is facing treason and gun-running charges since his arrest in Angola in 2007. His release has been a key demand of his Mend militant group. On Friday, lawyers for Mr Okah said he had accepted the amnesty offer and he is expected to released early this week. "The case is coming up tomorrow," lawyer Femi Falana told the AFP news agency on Sunday. He said it was "most likely" that the attorney general would decide not to pursue the case against Mr Okah. The Mend rebels have been fighting the rights of local people in the Niger Delta and for an increased share of Nigeria's vast oil wealth. In Sunday's statement, the group said the problems facing Nigeria were "nothing to do with militant freedom fighters but with the corrupt political leadership and certain arrogant tribes still living on past glory". But the government has in the past dismissed Mend as criminals.